In the ’90s, little girls’ birthday parties often produced an influx of Barbie, Lisa Frank, and Minnie Mouse. I really don’t remember any of the Barbie gifts I received, but one present in particular still stands out in my memory. It was a gift from my friend Kelsey, probably thoughtfully assembled by her mom. It was a craft box, complete with compartments for beads, ribbons, glue, and other supplies for making whatever I could dream up. I remember the first time I dove into the kit, and I can even picture some of the choker necklaces I made and proudly wore to school! 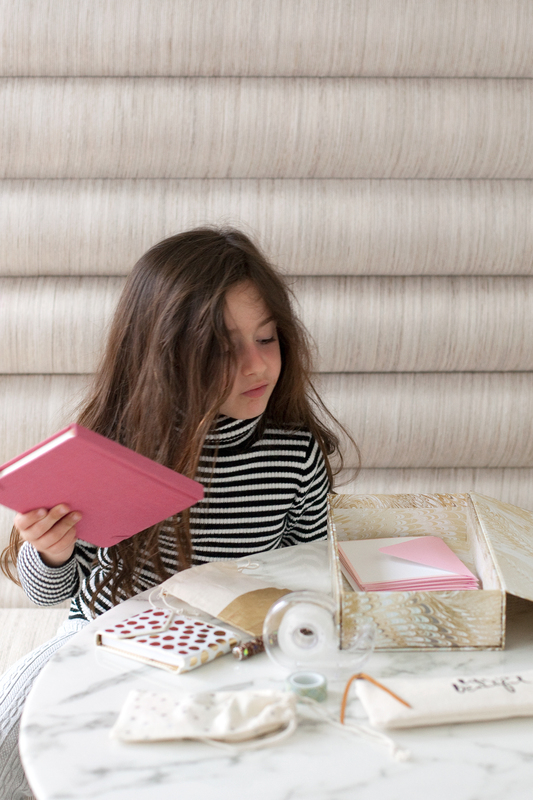 I wanted to give my girls the same kind of excitement and freedom that a craft box can offer. “This is your box,” I said upon presenting it to them. “You never have to ask my permission to use it, and everything you need is right inside the box! 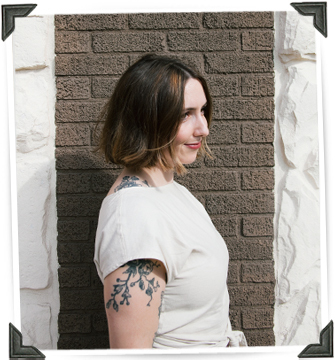 Play with it whenever you want.” The look of bewilderment and joy that flashed across Lucy’s face warmed my heart, as I wondered if she was feeling the same kind of feelings I felt at my second-grade birthday party. 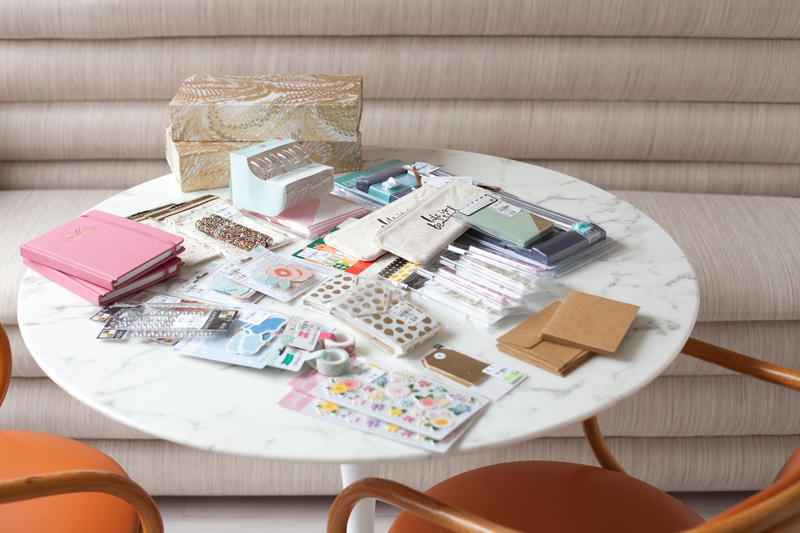 I’ve gotta say, putting together a comprehensive craft box like this wouldn’t normally be an inexpensive project. 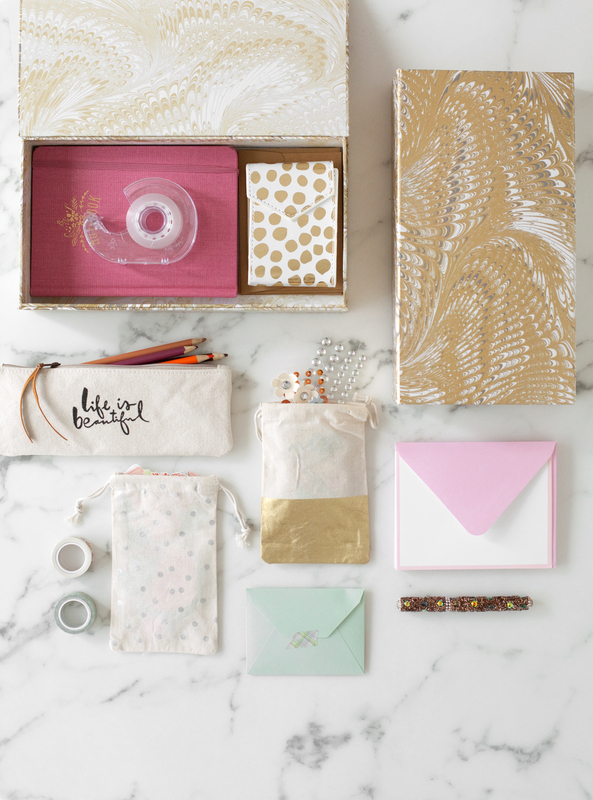 That’s why I teamed up with Tuesday Morning, to show how you can create a beautiful looking box of craft supplies, but for a small fraction of the price you’d pay at big chain craft stores or online. My local Tuesday Morning store has three aisle of craft supplies, full of paint, yarn, books, card, paper crafts, specialty pens, stamps— really, most of the things you’re likely to find at a craft store. But the prices are marked way lower. Most of the items I purchased were less than 50% off retail prices, but many were much more discounted than that. I felt free to throw lots of beautiful items into my cart, without worrying about the fortune they would cost. 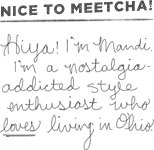 I don’t live and die by name brands, but I can appreciate the style and quality that I’ve come to expect from a lot of name brands in the paper crafting world, like American Crafts, Heidi Swapp, and Crate Paper. Tuesday Morning has these brands, plus a lot of others I’ve grown to love through the years. I definitely recommend you stop at Tuesday Morning first before heading to your usual craft store. They always have new items on the shelves, and your wallet will appreciate the tremendous savings! 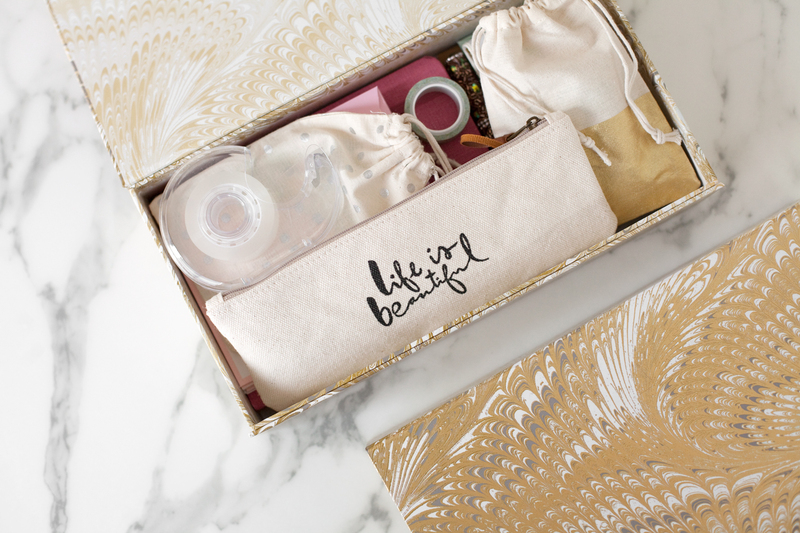 For the base of my kit, I chose beautiful magnetic-closure boxes that are big enough to neatly fit all of my supplies, but small enough to sit on the lap of a child for crafting during road trips. My local Tuesday Morning store has an entire aisle for decorative and crafty storage boxes. There were several that fit my needs, but I ended up choosing this beautiful marbled design because it coordinated with the contents I assembled. To fill the base of each kit, I chose a larger journal, smaller notebook with a fancy case (the girls think those little notebooks are so special! 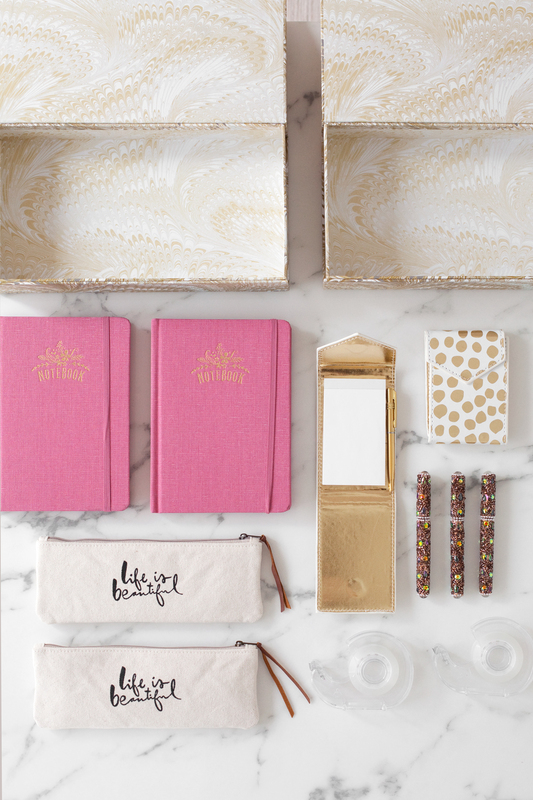 ), fancy pens, and a nice canvas case for colored pencils. Tuesday Morning has lots of glue dots and other adhesive options, but I choose clear tape, because the girls get a kick out of using the dispensers. Because I didn’t feel comfortable giving the girls scissors when they may be crafting unsupervised, I decided to pre-cut the booklet of Crate Paper patterned paper I had purchased from Tuesday Morning. 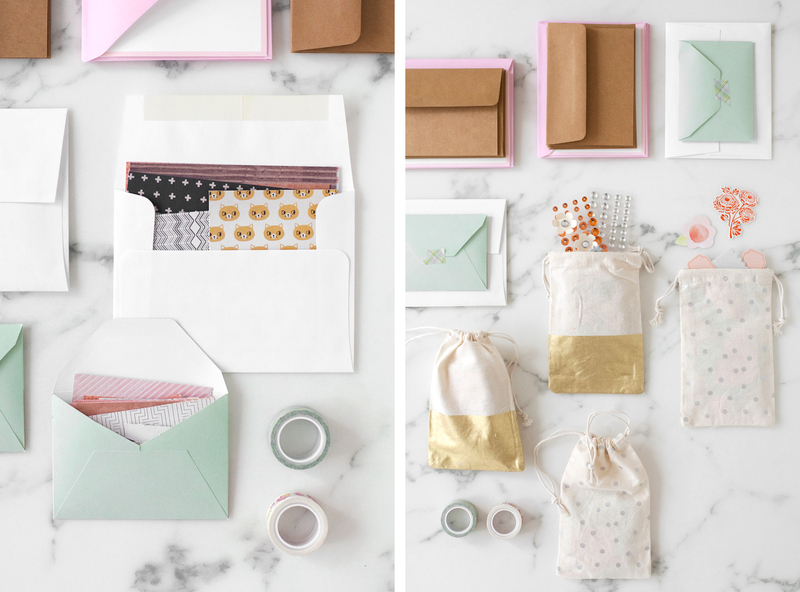 I divided the cut papers into a medium-size envelope and a small size envelope to contain them neatly in the kits. I removed the packaging material from all of the stickers and chipboard shapes I had purchased, and put them into these cute American Crafts fabric draw-string bags I also found at Tuesday Morning. In addition to regular greeting cards, the store also had a supply of blank cards, which I purchased to include in the craft kit. The girls love making cards for family and friends! And patterned washi tape? The girls have never seen it before, but I know it will bring their love for tape to the next level. After neatly packaging all of the prepped craft supplies into bags and envelopes, I nestled everything into the magnetic boxes, and closed the lid. My plan was to let the girls take these boxes on our three-hour road trip to Dayton this coming weekend, but I couldn’t wait, and let Lucy have some unsupervised craft time today after the boxes were finished. She was so happy, and seemed to notice all of the details that I had carefully considered when putting together the box. What a fun treat for me to make these, and for the girls to receive them! This craft kit in a box is a gift idea that I know I’ll use again and again, once the girls begin going to their friends’ birthday parties, and also for friends my own age. Thanks to Tuesday Morning for sponsoring this project! Make sure to check out your local Tuesday Morning ad to check out their special weekly deals, and stop into the store to see what new goodies they have on the shelves. Click here to find your local Tuesday Morning store. 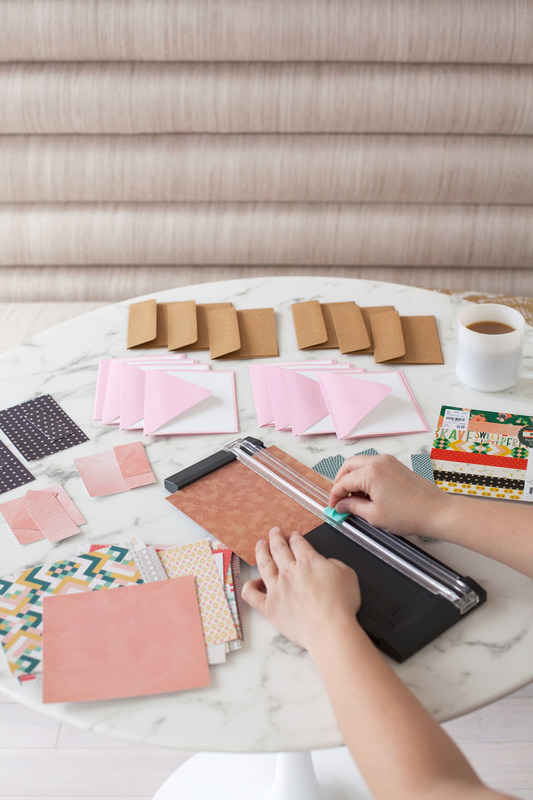 If you decide to make a craft kit in a box, I’d love for you to tag me in your social media shares so I can see! My favorite way to celebrate a new season is by hanging a new wreath on our front door! Just this one little touch of decor always inspires me to freshen up our house with a good cleaning and organizing so the few seasonal accessories I put out are highlighted and make our home feel extra special. I partnered with Hobby Lobby to show you how to make this simple and delicate wreath that reminds me Springtime in Ohio, where tree branches are still leggy as the green earth around them are preparing for blooming bulbs and the arrival of new life. Hobby Lobby has a nice selection of Springtime decor, but making my own decorations gives me more creative freedom, plus— making things is obviously more fun! 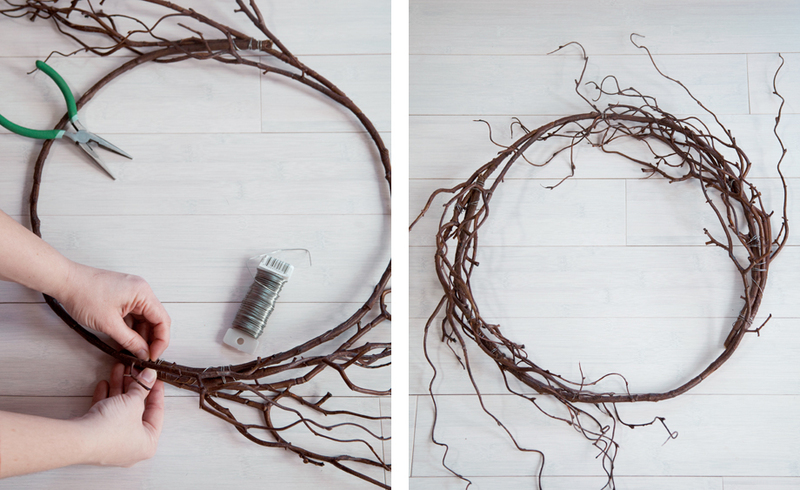 STEP ONE: Bend each of the wired branches into semi-circles, then wire them together to create a hoop shape. STEP TWO: Use additional wire to secure the flyaway pieces to to hoop, allowing some pieces to still pull away giving the wreath base a wispy look. 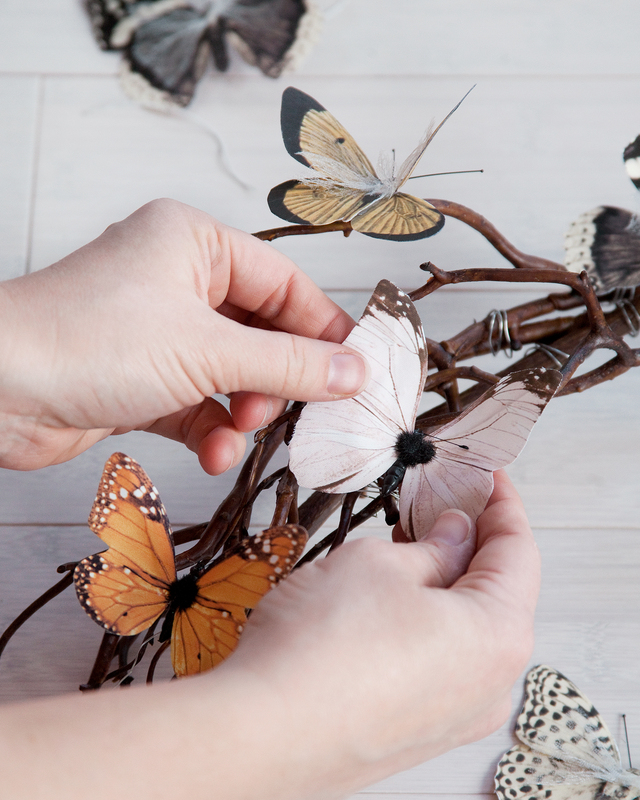 STEP THREE: Attach the fabric butterflies to the base. The more the merrier! 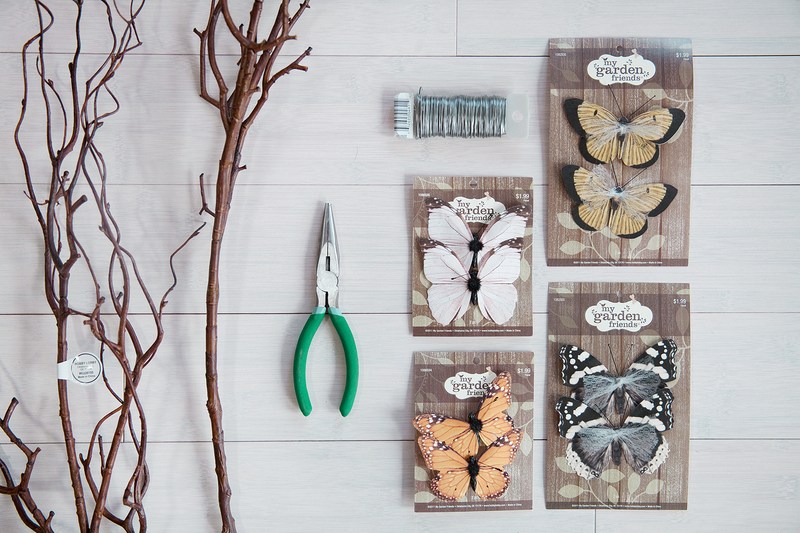 These butterflies are made of very thin printed fabric that feels a bit like paper, but won’t crease like paper. I found them in one of the floral supply aisles at Hobby Lobby. 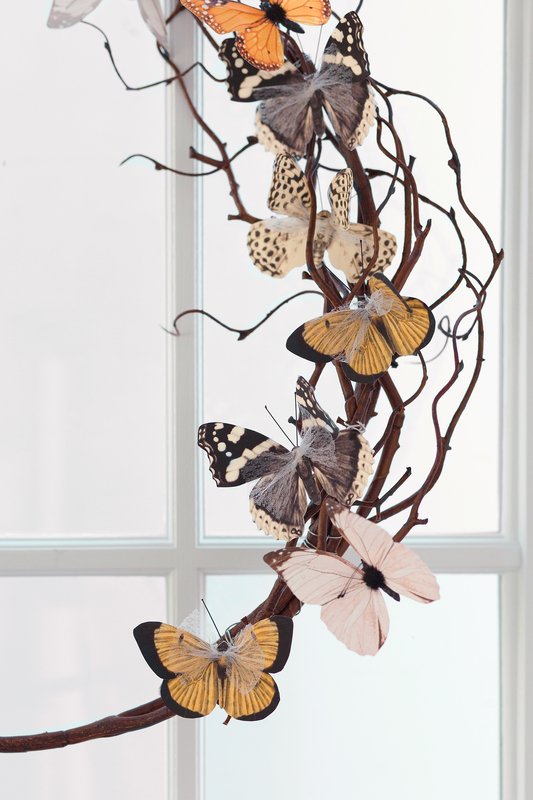 The butterflies have attached wires which make it very easy to attach to the branches. 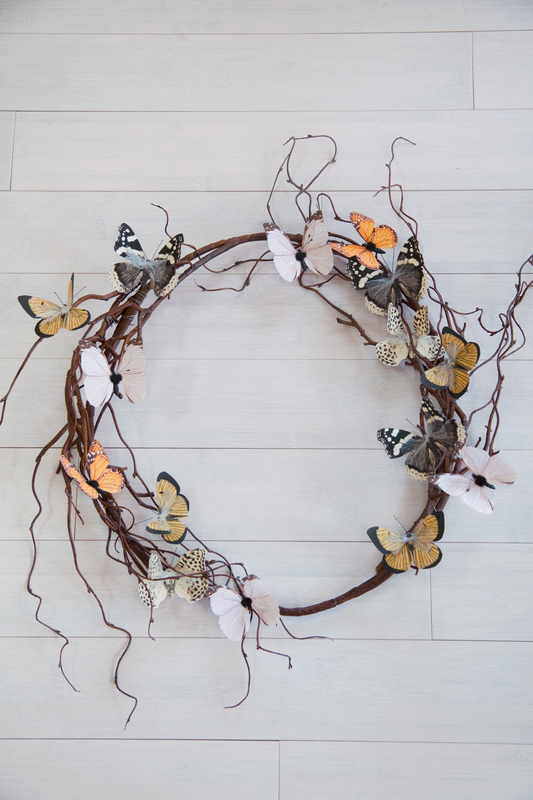 Then simply shape their wings to look like real butterflies who’ve just landed on your wreath. 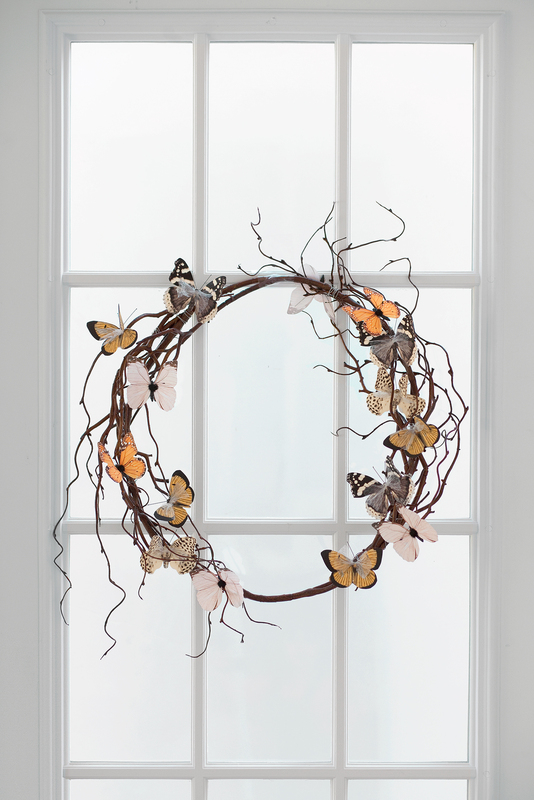 I love the delicate look of this butterfly wreath, and think it looks particularly lovely hanging in front of this windowed door with warm light streaming in around it. This is the door inside our sunroom — a spot I chose because I can see the wreath from our living room. After watching me make this wreath, my girls have butterfly fever, which have made the wheels in my head begin to turn once again! I’m thinking a butterfly themed birthday party would be a beautiful kiddo birthday party theme! I’ll definitely be keeping this wreath handy for when that day comes. What’s your favorite way to decorate for Spring’s arrival? Don’t forget to check out Hobby Lobby for wreath making supplies and other home decor. 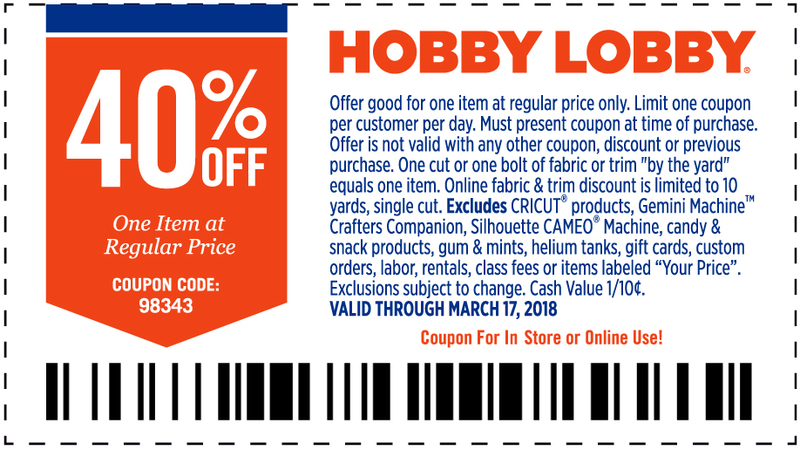 Bring this coupon with you for 40% off any regular priced item. Happy Spring crafting! You guys! It’s the eleventh hour. Advent season is almost over, and the kids won’t stop asking me to do crafts and eat snacks. Literally. All day. Every day. I thought this week we’d whip together an easy craft that would harness our festive energy (errr… make that their festive energy! 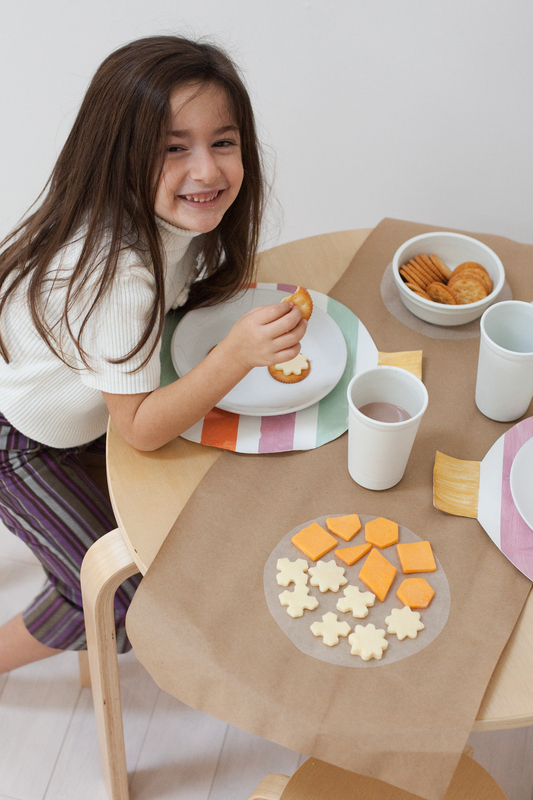 ), satisfy their desire for cheese and crafts, with the added benefit of making the holiday kids table the happening place to be. Lucy and I created these easy and fun ornament placemats with a bit of tablecloth vinyl and some acrylic paint we had on hand. 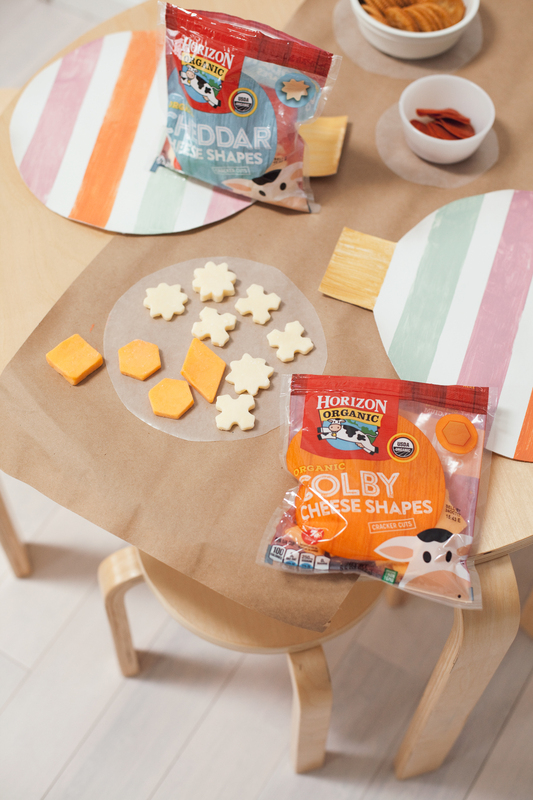 It was so fast and easy, just like these fun cheddar and colby cheese shapes from Horizon Organic! 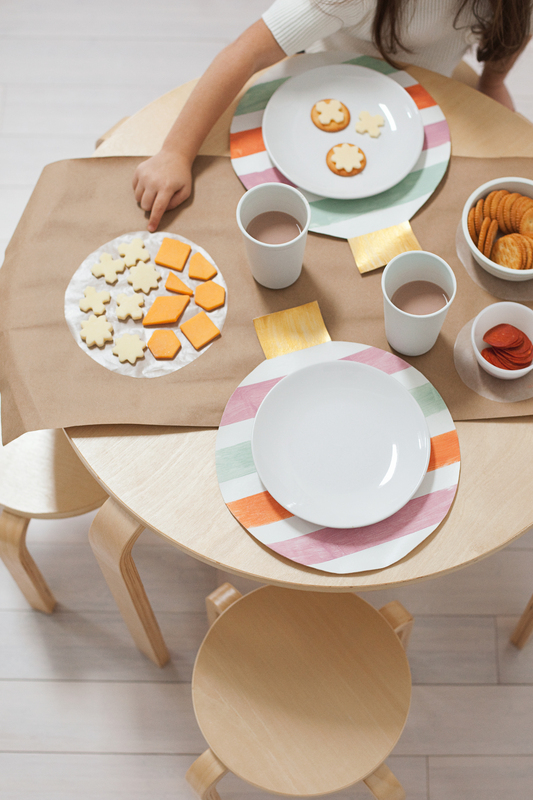 This kids table was a breeze to create, but the make-your-own-cracker-sandwich spread was the real star of the show. Oh, and did I mention there was chocolate milk? Thanks, Horizon for partnering with me on this fun kid-centric activity! For two seconds the girls quit asking me for gingerbread cookies. I hope this little craft can inspire you to have a little fun crafting with your kiddos before the big day. 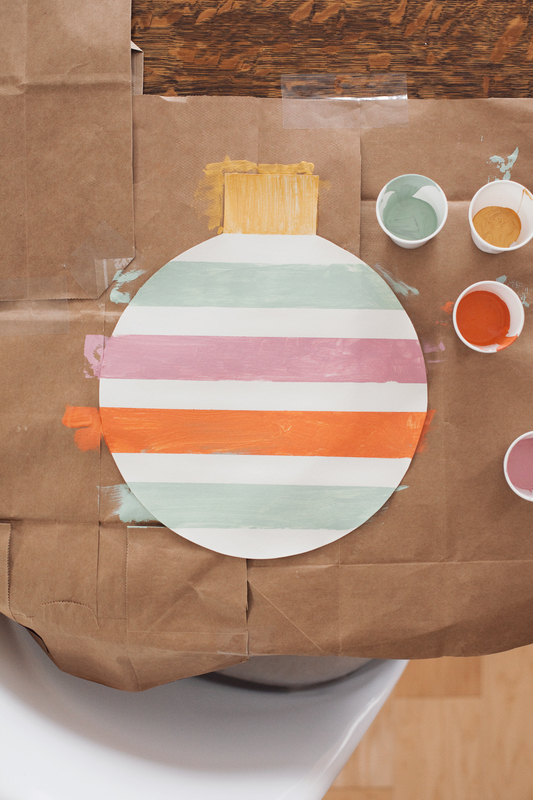 STEP ONE: Trace a round plate or circular platter, adding a square object at one end for the top of your ornament. Be careful using a permanent marker, though I was able to remove some marks that I accidentally got onto my ceramic plate. STEP TWO: Cut out the shape you traced in step one. STEP THREE: Tape off Stripes on the vinyl fabric using painter’s tape. This step was also handy to keep the placement securely in place on my paper-covered table. It made it easier for Lucy to paint. 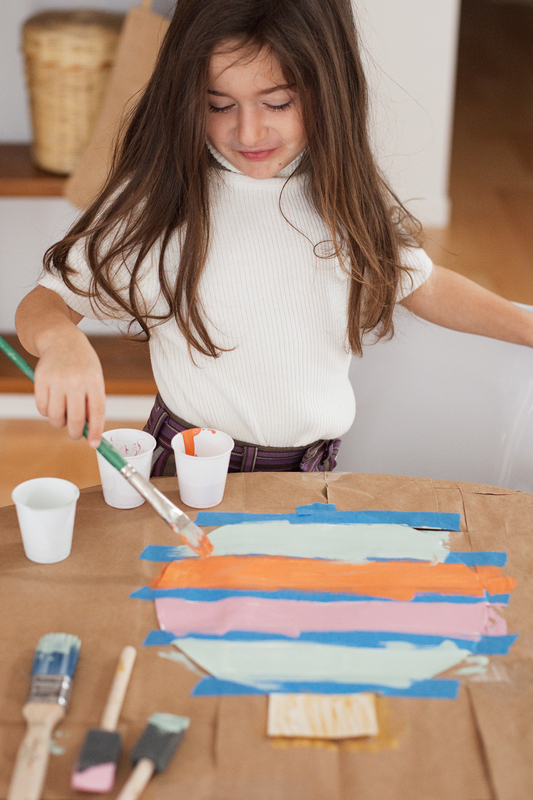 I gave Lucy four paint colors to choose from and told her she could make each stripe one color, or have fun blending the colors together and painting it as crazy as she wanted. She decided to just do one color per stripe, as you can see! STEP FOUR: Remove the painter’s tape and allow the acrylic paint to dry. It only take a few minutes if the paint isn’t on there too thick. 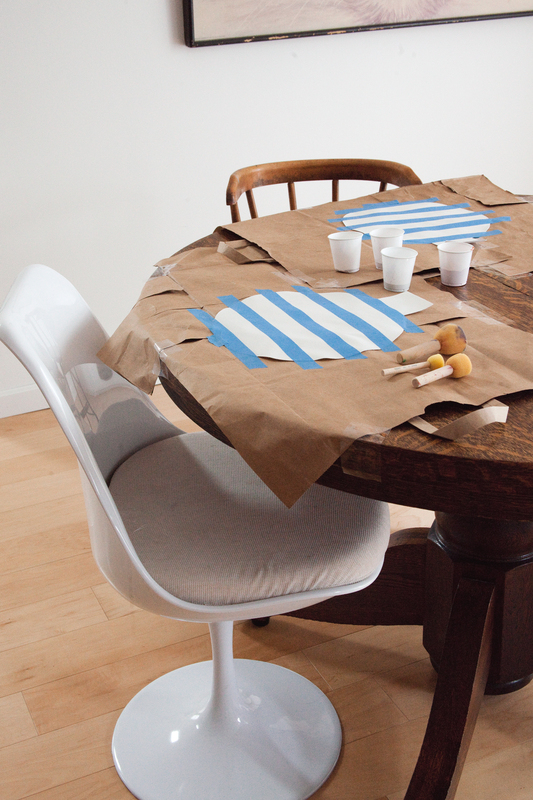 I put a kraft paper table runner on the girls little table, and considered giving them markers to doodle on it. I may feel braver on Christmas day. But this time around I just cut out wax paper circles to display the fun cheese shapes I pulled right out of the Horizon Organic bags. 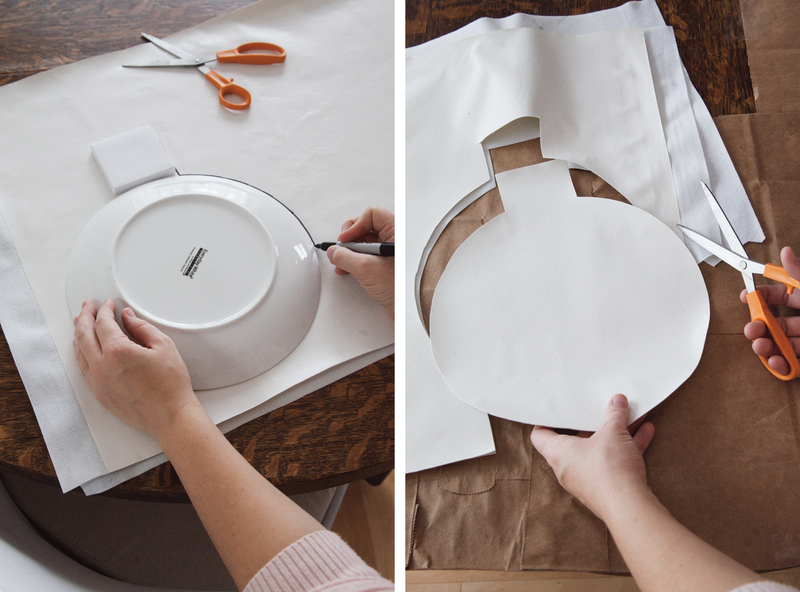 No need to take the time to use cookie cutters and then figuring out what to do with the scrap pieces. 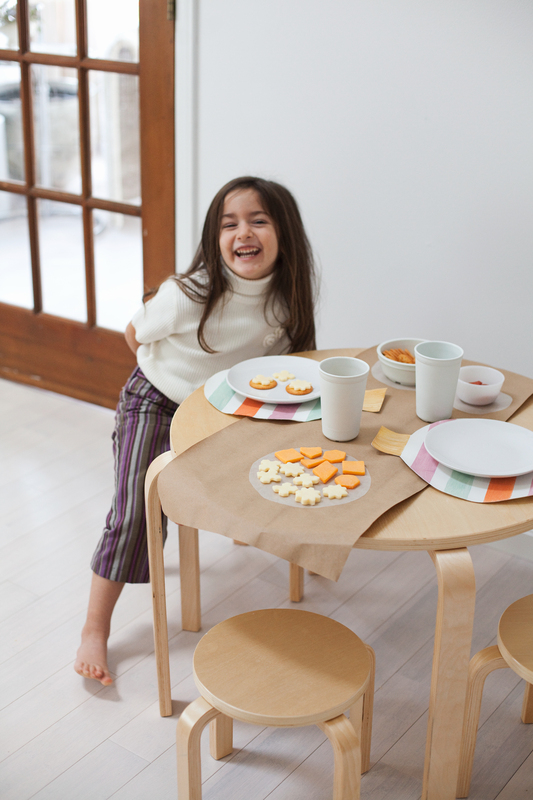 I also placed bowls of organic nitrate-free pepperoni and crackers on the table so the girls could make their own cheese sandwich crackers. It’s a favorite snack of theirs, and paired with chocolate milk, becomes a really special treat! I have a feeling the girls won’t mind being sent to the kids table when things get real crazy right before our Christmas feast. We’re excited to bake a big ol’ turkey in our brand new oven, but that doesn’t mean I’m a little nervous about pulling everything off! And in the midst of the crazy, I’m ready to keep the children’s bellies happy with a little snack to hold them over. Follow Horizon Organic on Instagram, Pinterest, and Facebook for more fun snacking ideas! This is a sponsored conversation written by me on behalf of Horizon. The opinions and text are all mine.